Ooh, I like your political rants! Yeah, it was a nice rambling rant (nice because I agree with you on these matters!) but I wanted to comment on the beech and its faux eyes. Its difficult to resist the temptation to anthropomorphize trees and I often indulge myself. Trees are as perennial as we are and deteriorate with age as we do. 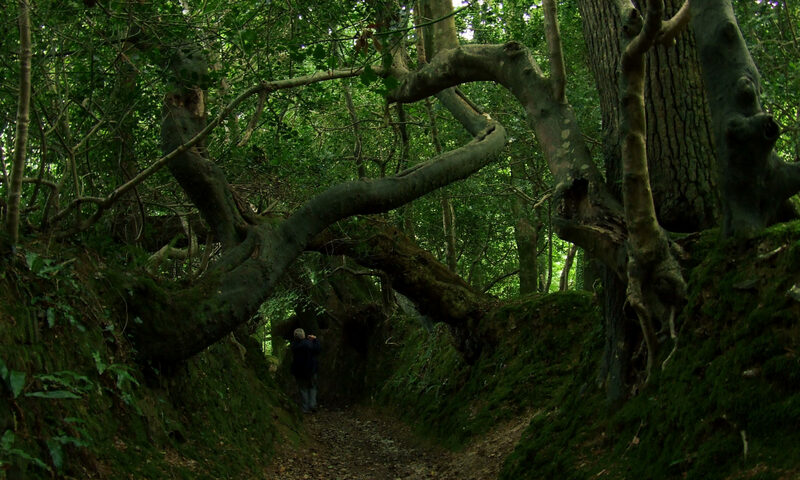 Tolkien’s ents are sort of a dream-transfiguration of trees, trees of the imagination. Larry – I actually don’t see any harm in anthropomorphism. The harm is in infantilizing and domesticating — two sides of the same coin. But seeing non-humans as persons — where’s the problem? With trees, I think it’s almost unavoidable, given their human-like trunks and ability to inspire reverence. My brother points out that Tolkein takes the name “ent” from the Latin word for being (whence “entity”), so clearly he intends to suggest something of the utmost primordiality. I suppose he must have been influenced by The Golden Bough in this. Man, when you rant you really rant! Anthropomorphizing? Actually I think it’s something that we do to identify more closely with the natural world around us. I think it is people who don’t consider themselves animals who most object to anthropomorphizing. Perhaps they fear they would recognize something of themselves that they’d rather not see? I love walking in the woods and oggling all those beautiful wooden legs sticking skyward out of the ground. Who ever decided that the leafy portions are the right side up? Gee Dave, wonderful rant! Made me glad to know you – if not glad about much else, except possibly to know that the pope looks like your grandfather (the only endearing thing I’ve ever heard about Pope Benedict). Yep. It’s been a battle of the minds, battle of the ideologies kind of week. Not to mention all the people who got dead in like . . . . ‘battle’ battles. While he can no longer burn heretics and Muslims at the stake, he can incite them to burn effigies of himself, which in his mind probably condemns them to the fires of hell just as definitively. You are probably about right. I wonder what news the Pope reads. My GOD, you do go on. Back to the leaves, man. I used to have the BBC as my home page; before that the NY Times. Now it’s the French Word of the Day. I can’t cope with life anymore if the news is the first thing that hits me in the morning, and some days I never look at it at all, though late afternoon is usually when I do it; J. on the other hand is a news junkie and I can count on a catch-up from him over lunch. And the pope/Pop-Pop thing was terrific – maybe it will make me somewhat more sympathetic to someone I find enormously unattractive. Perhaps they fear they would recognize something of themselves that they’d rather not see? No argument on the polarity of trees either (have we had this discussion before? Seems familiar). The tree-mind seems so wrapt up with its fungal symbionts, it’s hard to see how the roots could be anything other than head and hair. Jean – Thanks. Well, you know, I think if we’re ever going to defeat the patriarchy, we should begin by acknowledging that patriarchs, as individuals, can be quite likable and charismatic. And political campaigns take advantage of this: Ronald Reagan and Ariel Sharon, for example, were both sold to their respective electorates as kindly gradfathers. I remember as a kid feeling attracted to the grandfatherly visage of Leonid Brezhnev! Bobby – Yeah. Though in my cynicism I neglected to mention one, rather big piece of GOOD news: the federal district judge in California throwing out the Bush regime’s revision of the roadless rule on public lands and reinstating the CLinton rule. Two Dishes – I don’t know, but I did catch an amusing piece on NPR last week about a blogger who focuses exclusively on Vatican politics and gossip. Almost every night in the wee hours, he says, his stats show a visitor from the Vatican who consistently uses the German translation bot! Despite the strong resemblance, I have to say that my Pop-pop was a lot better looking than the pope. My scanner’s broken, or I’d put his picture up. Wasn’t that terrific, about the roadless rule? I’ve been walking on air.